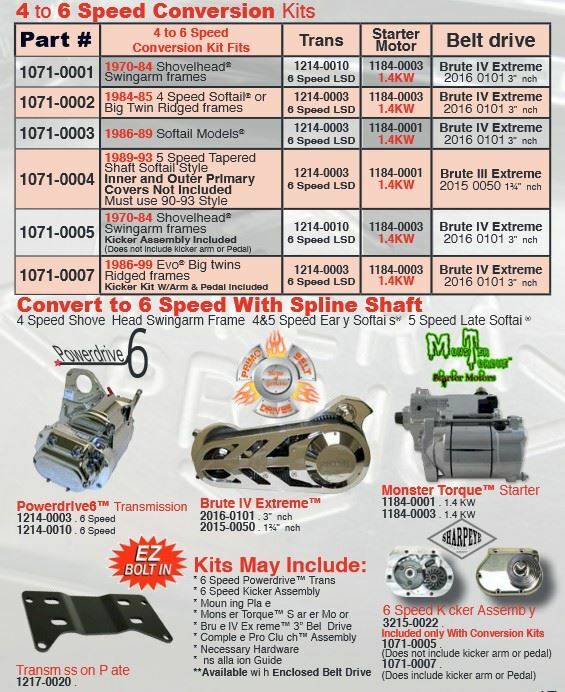 What does Rivera Primo’s Driveline Conversion Kit Fit? 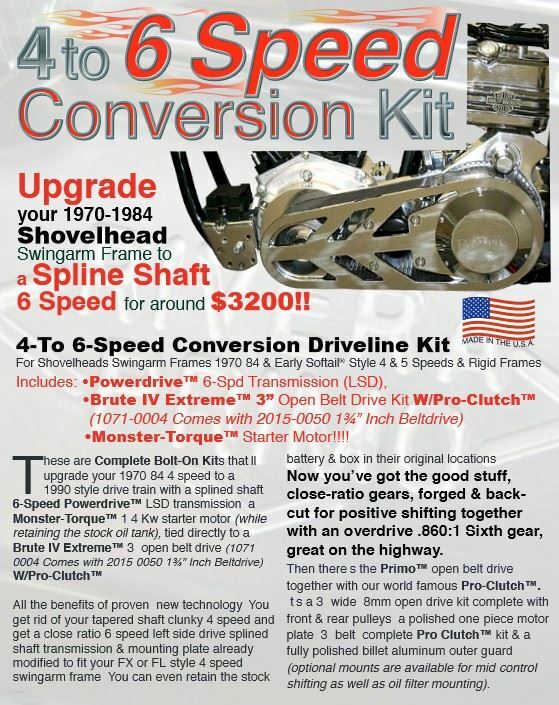 What’s so good about Rivera Primo’s 4 to 6-Speed Shovelhead Driveline Conversion Kit? This is a complete BOLT-ON kit for Harley Shovelhead Swingarm frames that’ll convert your old 4-speed transmission & drive line to that of a 90s style 6-speed Evo transmission & drivetrain. 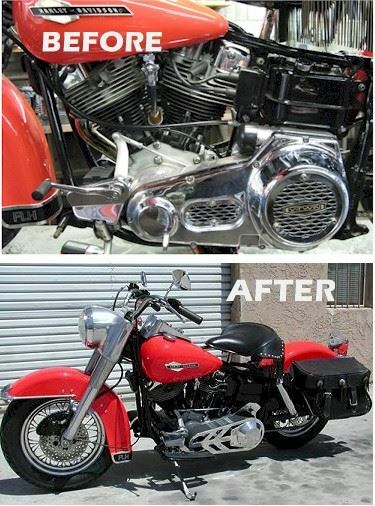 Now you can have Rivera’s dependable technology for your Swingarm Shovel in one complete kit. Rivera Primo went the extra mile to make this package a monumental one. 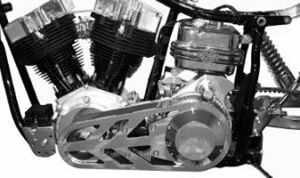 You get Rivera’s close-ratio splined shaft 6-speed, left-side drive powerdrive transmission and mounting plate already modified to fit your FX or FL style swingarm frame. You can even retain the stock battery and box in their original locations. Then there’s the Brute IV Extreme open belt drive package, together with the new pro-clutch assembly. 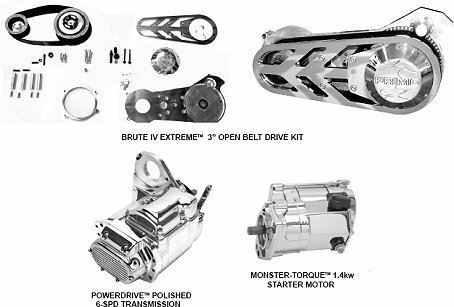 It’s a 3″ wide 8mm open belt drive kit complete with standard offset front and rear pulleys, a polished one-piece motor plate, 3″ belt, a complete pro-clutch kit, a fully polished billet aluminum outer guard, and finally a monster torque 1.4kw starter motor is also included too! Get yourself one of these kits and find out for yourself how much more there is to your Shovel.. You won’t be disapointed! 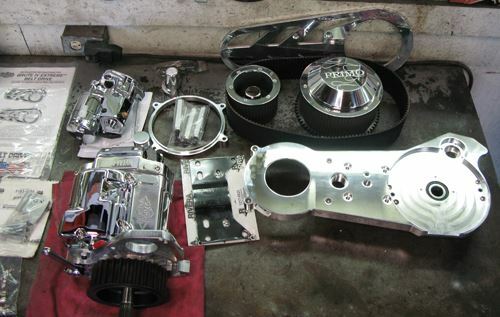 What does the Rivera Primo 4 to 6-Speed Shovelhead Driveline Conversion Kit Include? Click here to view detailed installation instructions.